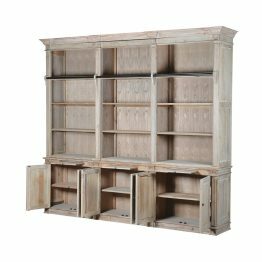 La Maison Chic offers a wide range of bookcases and display cabinets. The unique designs and styles definitely set us apart from the rest. We believe in offering something really different to the customers, designs which they haven’t seen before. In our quest to get more unique designs, we always do a lot of research. 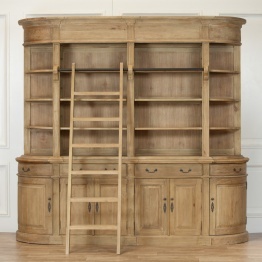 Our craftsmen produce intricate detailed work on bookshelves and display cabinets. This gives us the confidence to present the best designson the market. When we talk about cabinets, there are many usual styles. 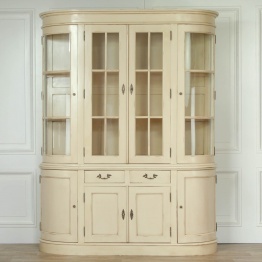 One of the most popular of them all is the French Display Cabinet. Customers particularly look for this design for its unique pattern. 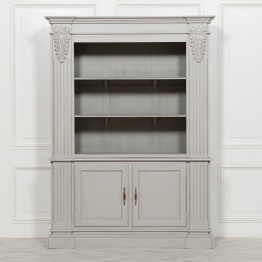 French Chateau Bookcases always have been a favourite among buyers. Booklovers are always in the need of bookshelves. Some people have their large collection of books stacked somewhere in a room. But that is neither good for the books nor for the general look of the room. Books should havea home that keeps them protected. To choose of bookcase from the large variety of designs and styles is not an easy task. Choice depends on the preferences of customer. You can choose from a variety of sizes, colours and styles. Our bookshelves and cabinets are made from wide range of materials: glass, metal, reclaimed wood. Some cabinets have glass-fronts to provide perfect canvas for displaying home accessories. Barrister Bookcases- This type originated in England and as the name suggests, it was created for the purpose of barristers. Barristers had to keep a lot of law books within easy access, which was an issue if they didn’t have precise bookcase to hold those books. These were mainly Wooden Carved Bookcases with glass-fronts. This type has been modified a lot in order to keep up with time. Modular Bookcases- Bookcases that may or may not be open on the back can be another very unique piece of furniture for your home. They can be small or large and can be kept individually or in a pair. There are endless creative ways by which you can take these bookcases into styling. Stack them vertically or horizontally, one above another and you get a great Wooden Display Cabinet. Folding Bookcases- Shelves that have units folding up are great for small living spaces. Industrial display cabinets can be found under this category. Such styles are generally sleek in design. Corner Bookcases- Customers who worry about the small space styling must definitely go for this one. It is definitely a space-saving and eye-catching option for those who want to keep their books organised in style. You can attract the attention of your guests by keeping the ceramic urns and photo frames mixed with books in the corner in the French styleBookcase. 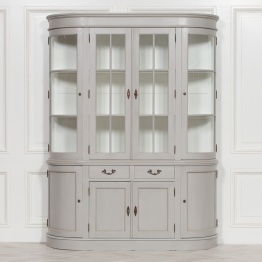 Other styles available at La Maison Chic are Louis Style Bookcases, Chinese Display Cabinets and Painted Bookcases which form a great collection of French Living Room furniture.